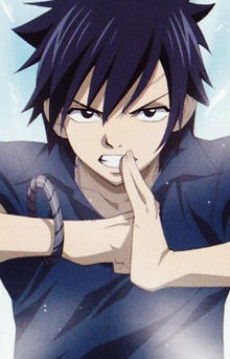 Gray Fullbuster is a member of the Fairy Tail guild. He is an 18 year-old ice mage, practicing ice alchemy, the art of molding ice. Due to his training history, he is most comfortable in little clothing and often forgets to wear clothes or quickly takes it off, thus often being accused of being an exhibitionist. He and Natsu have a friendly rivalry, and can often be seen fighting one another. Lucy believes the nature of his magic is the reason that he and Natsu constantly bicker. His member stamp is on the right side of his chest. Gray's adeptness and strength as an ice mage is quickly shown in the story. During the Lullaby of Death arc, he teams with Natsu and Erza to defeat the demon awakened from the evil spirit from the Lullaby of Death. Members of the League praise his quickness at molding ice. Later in the story, he defeats Juvia, one of the Elemental Four of Phantom Lord. This victory may have been partly influenced by Juvia's liking to Gray. Juvia comments on Gray's skill, shocked that he was able to freeze both her boiling water and the rain. After Phantom Lord's defeat, Juvia secretly spies on Gray, bringing a packed lunch for Gray while he and the guild are rebuilding the headquarters. In certain panels, Gray's necklaces looks quite similar to the Rave Stone which is a crucial part of another one of Mashima's stories, "Rave Master." Mashima has stated he doesn't remember the name. He takes off his clothes because Ul made him do it as one of her teachings and now it's a force of habit.